A homemade scrub can be as effective as a ready-made drugstore product, if not more effective. In addition, it is a good idea for a gift, because it is not only unique and unrepeatable but also does not require standing in a long queue. Get to know the recipes for homemade body and face scrubs. It seems that scrubs bought in healthy foods stores with “natural” products are a compromise between home-made peels and those sold in drugstores. But is it really so? Only those products that are made exclusively of natural ingredients are natural. The healthiest are scrubs with a simple and short composition, which do not contain (mainly) paraffin and perfumes. Below you will find the recipes for some homemade scrubs. 3 drops of clove oil. Honey is not only a healthier substitute for sugar but also an effective antioxidant that will work in the fight for beautiful skin. To prepare the scrub, just mix all ingredients with each other and then put into a clean jar. 20 drops of lavender oil. For years, lavender and marigold have been used by women for beauty treatments. This is due to substances contained in these herbs that effectively regenerate the skin. To prepare the scrub, mix all the ingredients together and put them in a tight and dry package. Mix all the ingredients together, then put the whole into a tight and dry container. Cinnamon and chili have a warming effect, which is why natural scrubs on their base will also work in the winter season. To obtain even better effects, you can add a few slices of chili pepper to the product. juice squeezed from a quarter of a lemon. Combine salt with olive oil and lemon juice. Then, apply the mush to the wet skin. The salt scrub has cleansing, anti-inflammatory and disinfecting properties. a bag of dried mint leaves. Mix all ingredients thoroughly and then apply to moist skin. 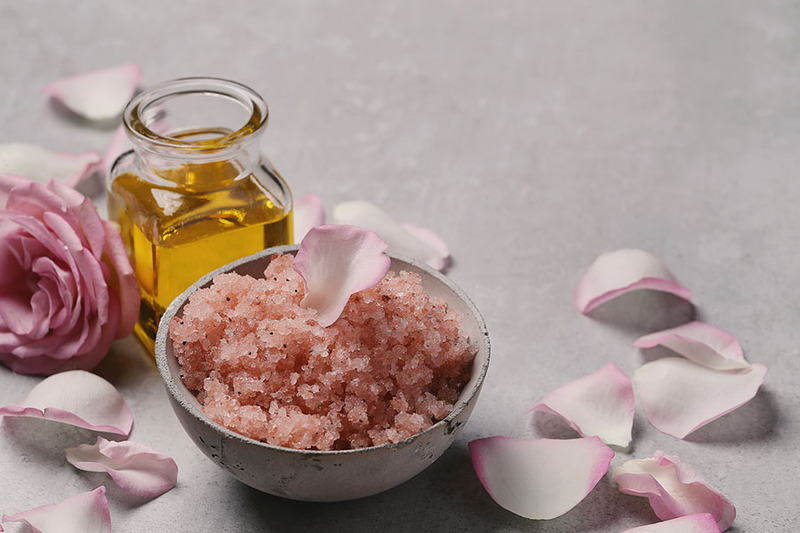 In order to effectively purify the skin in the summer, perform a homemade facial scrub that cleanses and refreshes the skin and also improves its color. In addition, it smoothes the skin, softens it and stimulates microcirculation. Due to the fact that it exfoliates dead skin, it prepares the face for the absorption of creams better. If we add shower gel to the above ingredients, we can use the mixture as a body scrub. The ingredients are to be mixed together. Apply the scrub to the moistened face and massage gently but firmly with circular movements. Mix ingredients together and apply to the face with gentle movements. Optionally, you can add a teaspoon of lemon juice, which has brightening properties. To prepare a peeling, just pour warm water over the oatmeal cover it fully, and leave aside for 10 minutes. When the oats absorb water, add honey. 5 teaspoons of olive oil. The ingredients are mixed together and applied to the moistened skin. Because the sugar dissolves quite quickly, the peeling should be used immediately after its preparation. Add the maize flour to the juice in an amount that is enough to form a slurry. Orange face scrub will not only be beneficial for the face, but also for the whole body. Next » 10 things you must know before having professional beauty treatment carried out « Previous Korean cosmetics vs. the rest of the world. How do sheet facial mask work?